Anyone up for a little deciphering? 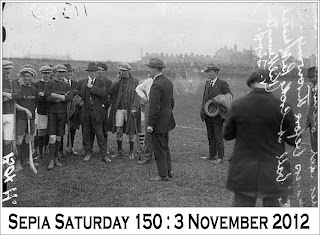 Can you make out what the (albeit reversed) hand-writing says on the right-hand side of this image? Here's a snip, rotated, enlarged and cross-processed. Any luck now? Once again, I'm afraid we've got MEN, or at least men and youths. Now, I've not seen it before, but I know in Ireland they have an odd sport called, "hurling". I'm pretty sure that that's what's been going on here. I would love to know what those buildings are in the distance. Lots of hats - men's hats this time, and as someone mentioned (might have been Marilyn, I can't recall) that one fella looks like he's on a cell phone, but since this image is from the 1920s, that's quite an anachronism! 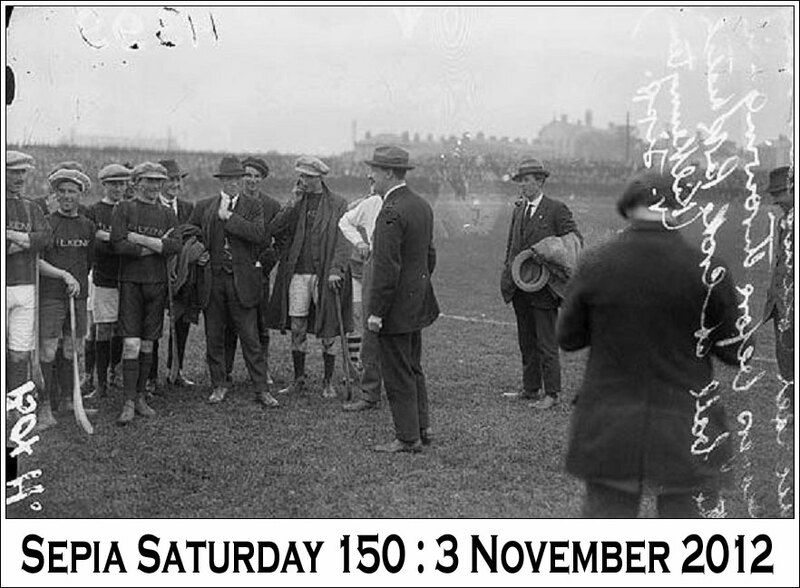 This is actually Irish Revolutionary Leader, Michael Collins, at the Senior Hurling Championship match against Dublin on September 12, 1921. He's talking to the Kilkenny hurlers at Croke Park in Dublin. (Collins would be assassinated only a year later, at the age of 32, on August 22, 1922) Now I'm wondering what that other fellow might be reaching for in his vest pocket? Go political, go sporty, go fashionable, go inventive ... just GO! By the way, don't forget to sign up to "follow" me and other SS participants, and I'm sure they will do the very same, as will I. Your kind message has just been passed onto me by the ship's reception. We are all fine and by now we are on our way back across the Atlantic and well out of harms way. 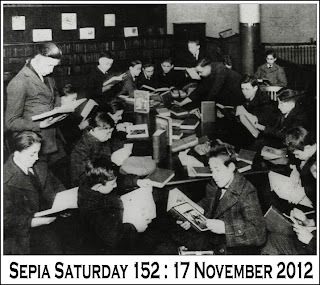 We were really touched by your message; it once again illustrates what a real community Sepia Saturday is. Internet connection is dreadfully slow and intermittent and frighteningly expensive so could I possibly ask whether you could put a message on the SS Blog and Facebook Page assuring all that we are safe and well and extending all of our good wishes to all those who are facing the perils of the weather at the moment. THE S.S. AZURA, LEAVING SOUTHAMPTON WITH ALAN AND ISOBEL ON IT! Men, Men, Men, Men, Men-dee-Men-Men! 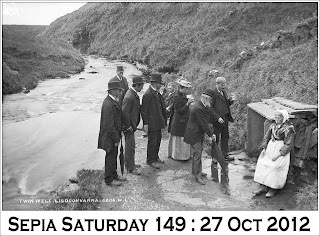 This picture is of "Twin Wells" on the banks of the River Aille at Lisdoonvarna in County Clare, taken around the turn of the century (1900). 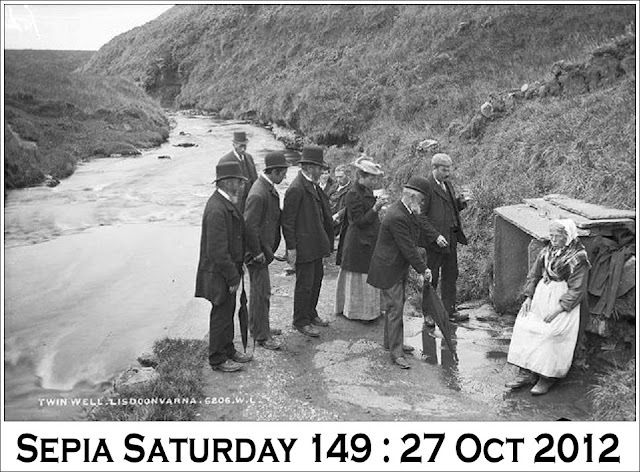 Apparently the waters were acclaimed as restorative and this place was designated a spa. By the looks of things, the old lady in the photo has not benefited, or isn't drinking them. Ha! Go on my dears, and make what you can of this, be it spas, water, old ladies, young ladies, tourists, umbrellas, homeless people. Go on! I cannot possibly think of this spot in the south of Ireland without giving you a little related treat. Here's a YouTube clip of a somewhat famous tune entitled, "Lisdoonvarna" by the equally famous, Christy Moore. Bear with the brief advertisement at the beginning. Here we go! Another couple of teasers for you - and look, in two weeks, not a man in sight!!! I have made an effort to visit everyone who posted last week, and if you had a method whereby I could follow your blog, I have done so. I would be most grateful if you would reciprocate. A hearty thanks to all who have done so, so far. 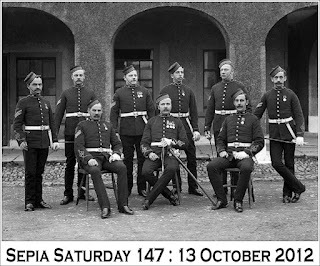 Don't forget to visit all the undoubtedly stellar interpretations of the photo below, by visiting the Sepia Saturday blog (beginning on Friday) and clicking on the links. Thank you! I have finally made it round to everyone's posts from last week, and I must say, you all exceeded expectations. I think we learned a great deal about various troops, and soldiers and battles. Those who drifted from the theme were no less enlightening and entertaining. Thank you all! I'm posting a bit early again to give us all some extra time. 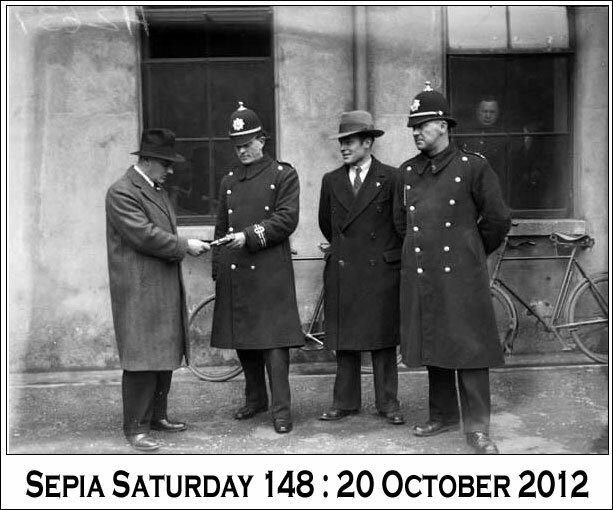 Then there's the obvious tack with the Police, or "Coppers" as you Brits like to say. Incidentally, it has come to my attention that a few of you have issues with posting comments where an Open ID is required. It would be simpler if comments were set up differently. In Blogger, go to Layout; choose Settings, Posts and Comments and select "ANYONE". With this set-up, visitors will have not trouble signing in to share their thoughts. I know that everyone wishes to reciprocate when others have taken the time to leave a generous comment on their own blog. To control who DOES visit, select "Always" under the Comment Moderation option, and insert an e-mail where notification for pre-screening can be mailed. I myself, have made every effort to add your blogs to my sidebar, and would be appreciative of the same for mine. I would also welcome any new "Followers", if you've found my posts of interest. Now to next week's business. Below are the preview photos for the coming two weeks. No more uniforms!!! 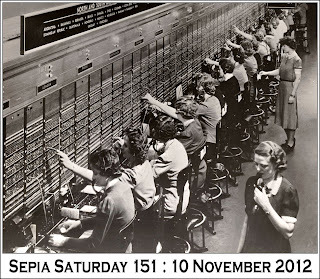 I am new to the procedures for posting the calls for Sepia Saturday, so I hope I don't make any blunders, and I shall try to live up to the skill and erudition of our wandering host. In any event, I will do my best to make these next few weeks enjoyable and up to par. The above picture just caught my eye. I suppose that's because my father was an Army man. As a result, I'm a big fan of military movies, and so anything with a regimental look is bound to draw my attention. 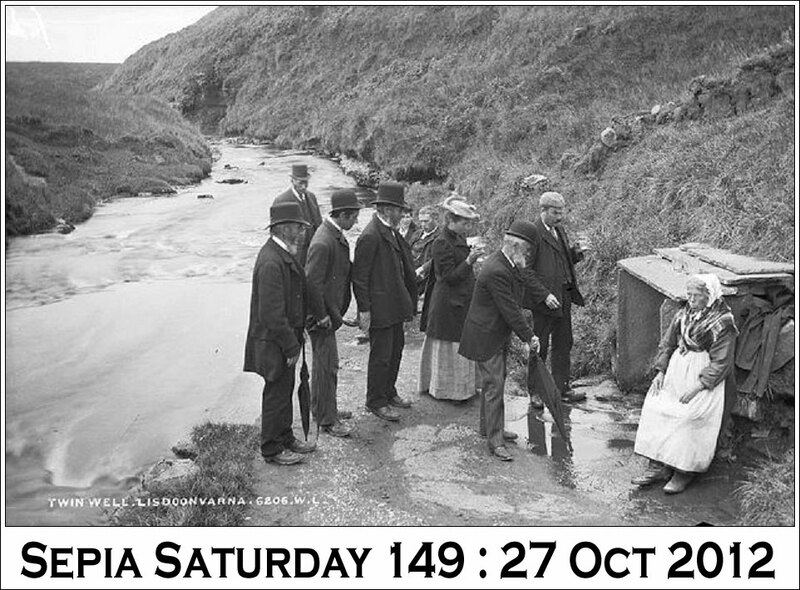 This photo has been borrowed from the Flickr Commons National Library of Ireland (I'm also a bit partial to anything Irish, since my dad was born in the the North of that country.) I hope you like the image! In terms of a theme, there are many directions one could go with this. 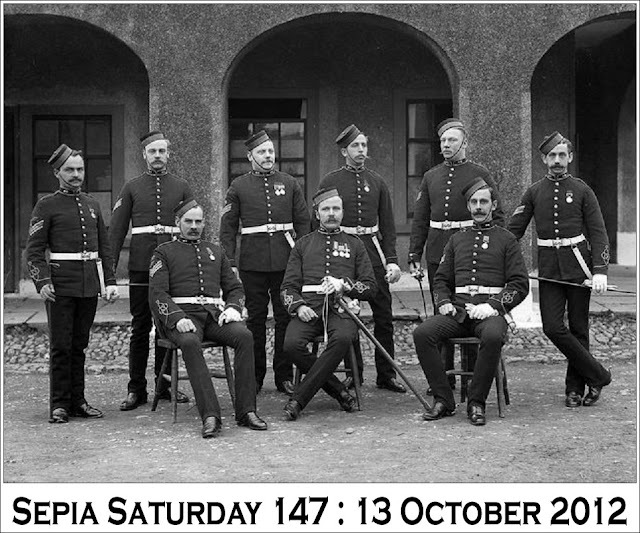 You could deal with the military angle (of course, that's obvious), group photos, uniforms, medals and regalia, dapper caps, or even shiny boots, And well, it looks as if only one of the chaps above hasn't got a moustache, so that's a possibility as well, isn't it? Other than that, you can choose to veer off this path entirely and do your own thing. 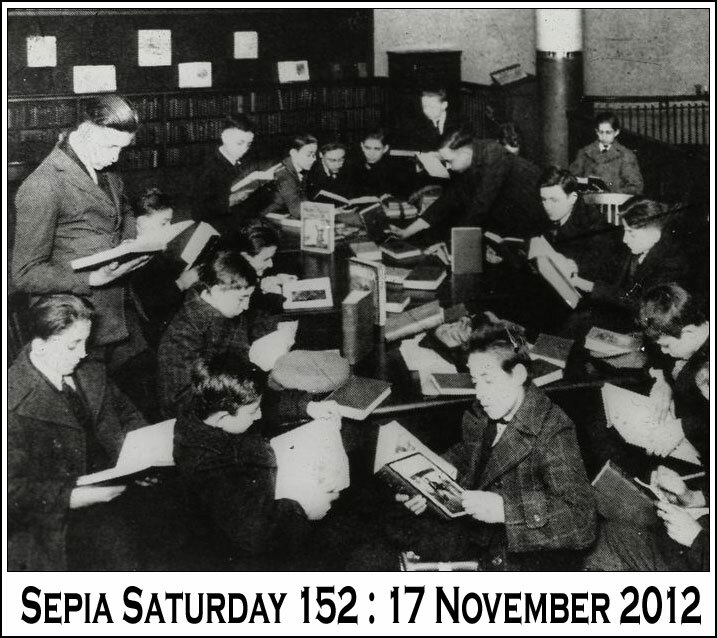 We are not judgmental here at Sepia Saturday; we'll read it all, won't we? So, get your posts composed, and just post your link below, so we can all have a look to see what you've come up with! Sorry folks, I managed to make the rounds to about 2/3 of your posts, but this morning I awoke with a severe pain in my right shoulder blade (repetitive strain from beating muffin-batter, I think) and will not be following up until tomorrow or later with the remainder of you. I do apologize. Watch for the next "call" on Wednesday morning! Cross your fingers, folks! Here's my first crack at Mr. Linky. Hope it works! So, away we go. I am packing my bags and loading up my Kindle ready for my time away. Let's hope the seas are calm and the sun is shining. 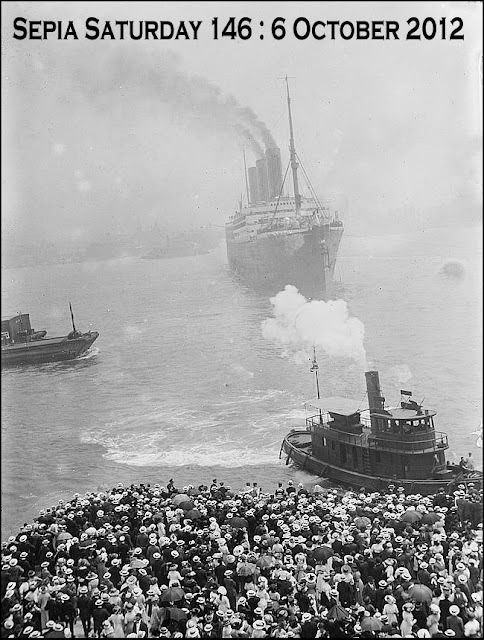 My archive picture this week shows the German built SS Imperator arriving in New York on her maiden trans-Atlantic voyage in June 1913. She was a fascinating ship, the Imperator; built for size, speed and luxury during the age of the great liners. In some ways she was a little too luxurious and a high centre of gravity caused her to suffer from poor handling and the tendency to list from side to side. This resulted in her becoming known as "the Limperator". The problem was eventually solved by the removal of the marble bathroom suites from the First Class cabins! 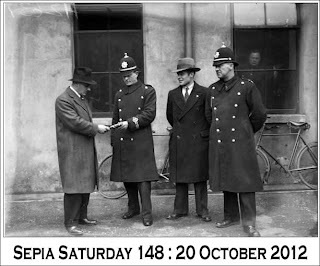 So your theme for Sepia Saturday 146 (post your posts on or around Saturday 6th October) is anything to do with ships, the sea, holidays, transport, crowds, or marble bathroom suites. As usual, post your posts and then add them to the Linky List below. As I mentioned last week, I am glad to announce that Kat Mortensen will be looking after things whilst I am away. I look forward to catching up with all your posts as my ship limps from side to side and I ponder on the space where the marble bathroom used to be. For those wanting a peek into what will be coming up during Kat's stewardship, here are the next two archive image prompts. So, off I go in search of another pair of socks and my best dickie bow tie. See you all on my return. And good luck to Sepia Saturday and all who sail in her.